Many women deliver their babies by cesarean section (c-section). Since a c-section is surgery, it can certainly bring about some challenges for moms who want to breastfeed. Whether it's planned or unexpected, the surgical delivery of a child can affect breastfeeding. Of course, that doesn't mean you can't or shouldn't breastfeed. It is certainly possible to breastfeed successfully after a c-section. Here's what you need to know and seven tips to get you off to a good start. 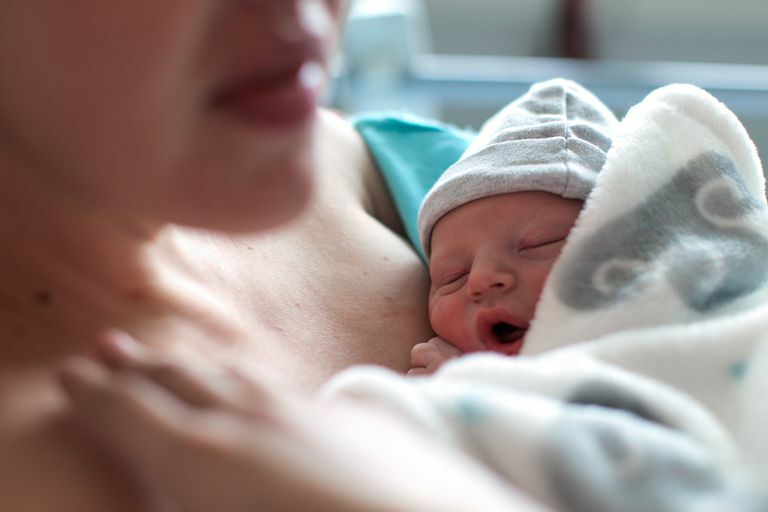 By understanding the breastfeeding challenges that you may face after a c-section, you can prepare for them and face them with knowledge and confidence. Here are some of the ways a c-section can affect breastfeeding. Depending on the type of anesthesia you receive for your surgery, you and the baby may be sleepy for a while after the procedure. If you have general anesthesia, you will be able to breastfeed once it begins to wear off and you are feeling up to it. With an epidural or spinal anesthesia, you may be able to breastfeed while you are still in the operating room or shortly after in the recovery room. Pain from the incision site and afterpains from your uterus contracting back down in size can make it very uncomfortable to breastfeed. The side-lying and football hold positions are good choices while your incision is healing. If you want to try nursing while you're sitting up, you can place a pillow over your incision site to protect it. It may be tough in the beginning, but breastfeeding will get easier as your body heals. It's very important that you take your pain medication after you have a cesarean section. If you are in pain, it will be harder for your body to heal, and you will be more uncomfortable while you breastfeed. Some medications are safe to take while you're breastfeeding, so be sure to tell the doctor you'll be nursing your child. And, even though the pain medication will be safe for the baby, some of it may pass through the breast milk and make your newborn sleepy. The sleepiness caused by the pain medication is not harmful to your child, but it can be a challenge to breastfeed a sleepy baby. If you have a cesarean section, it may take longer for your milk to come in compared to if you have a vaginal delivery. You'll want to put the baby to breast as soon as possible and breastfeed very often to stimulate milk production. If you and your child are separated after delivery, you will not have the chance to begin breastfeeding right away. Ask to use a breast pump if you will be separated for more than 12 hours so you can start to stimulate your breasts to produce milk. Pump every two to three hours until you can put the baby to your breast. If the surgery was very difficult or if it was an emergency that you were not prepared for, your physical and emotional state may interfere with your desire to breastfeed. A traumatic birth or unexpected C-section may cause sadness and a sense of failure. If the birth did not occur the way you imagined, you might also be feeling a sense of loss. These are common emotions, and you are not alone. Talk about your feelings and accept support. Keep in mind that breastfeeding your baby may actually help you get past the difficulty and sadness. It may be more difficult, but you can definitely breastfeed after a cesarean section. Here are seven tips for success. Start breastfeeding as soon as possible after your c-section surgery. If you have an epidural or spinal anesthesia, you'll be awake so you may be able to breastfeed right away. However, if it's necessary to have general anesthesia, your recovery will take longer. If you can't breastfeed right away, ask to hold your baby skin-to-skin. Then, put the baby to the breast as soon as you safely can. Get help positioning your baby. Not only will have an abdominal incision to protect, but you'll have to deal with an IV line and maybe even a blood pressure cuff, too. Since the nurses and the hospital lactation consultant work with mother's who've had sections all the time, they can show you comfortable holds you may not have known about. Breastfeed very frequently, at least every one to three hours. Even though you may be exhausted and in pain, you're more likely to be successful if you breastfeed early and often. Keep your baby with you as much as possible. You will not be able to get up to take care of your child on your own right away, but if you have your partner, a friend, or relative stay with you, you should be able to keep your baby in your room. Use a breast pump if you can't be with your baby. Pump every two to three hours to stimulate the production of breast milk. Don't be afraid to take your pain medication. You will be more comfortable to breastfeed. It may also help you relax so your body can concentrate on healing and begin making breast milk. Take advantage of the extra time in the hospital. You will be spending a little more time in the hospital compared to someone who had a vaginal delivery. While you need this time to rest and begin healing, a longer hospital stay also allows you more time with the hospital staff and the lactation consultant. Use this time to ask questions and learn all you can about breastfeeding your child so that you will feel more comfortable and confident when you get home. A cesarean section adds a few common obstacles to successful breastfeeding. It's easy to become overwhelmed by the pain and the physical and emotional exhaustion. But, just because it's difficult, doesn't mean it isn't possible. It is! Take your time, accept help, manage your pain, get enough rest, and stick with it. Breastfeeding will get easier as you heal. If you're prepared and committed, you can overcome the challenges and successfully breastfeed after your c-section. Keister D, Roberts KT, Werner SL. Strategies for Breastfeeding Success. American Family Physician. 2008 Jul 15;78(2). Lawrence, Ruth A., MD, Lawrence, Robert M., MD. Breastfeeding: A Guide For The Medical Profession, Eighth Edition. Elsevier Health Sciences. 2015. Montgomery A, Hale, and The Academy of Breastfeeding Medicine TW. ABM Clinical Protocol# 15: Analgesia and Anesthesia for the Breastfeeding Mother, Revised 2012. Breastfeeding Medicine. 2012 Dec 1;7(6):547-53. Protocol AB. ABM Clinical Protocol# 7: Model Breastfeeding Policy, Revised 2010. Breastfeeding Medicine. 2010;5(4). Riordan, J., and Wambach, K. Breastfeeding and Human Lactation, Fourth Edition. Jones and Bartlett Learning. 2014. Can You Breastfeed If You've Had Weight Loss Surgery?